In large bowl, beat cream cheese with electric mixer on medium speed until smooth. Beat in condensed milk a little at a time, scraping side of bowl as necessary. Beat in vanilla. Cover and refrigerate at least 2 hours. Make cookie dough as directed on pouch. On work surface, roll out dough. Using medium and small star-shaped cutters, cut out 24 medium stars and 8 small stars. Bake and cool as directed on pouch. Place spoonful of filling on medium star. Place another medium star on top, turning slightly so points are staggered between points of star below. Add another spoonful filling, followed by third medium star. Top with 1 more spoonful filling and 1 small star. The cheesecake filling does better the longer it is refrigerated. Can be made the night before. 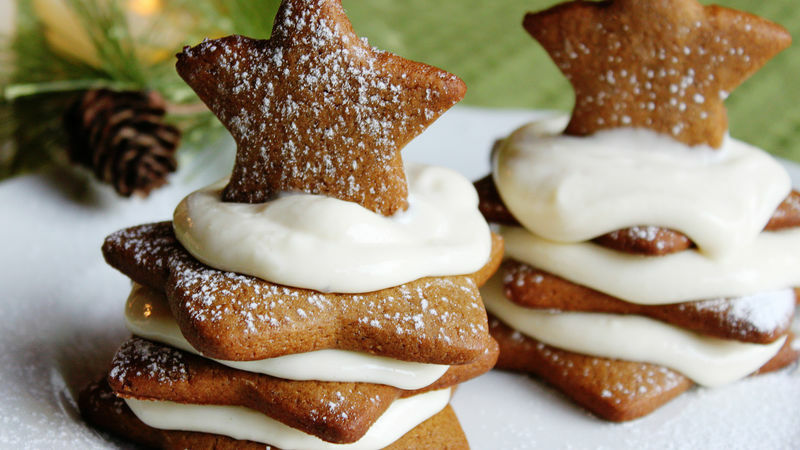 Sprinkle with powdered sugar for a festive touch.